Since the Moon’s tidal forces alter everyone’s emotions (and it is the ruler of the sign of Cancer), this snapshot of Robin shows how the personality and psychological nature of Cancer Sun Signs become intensely emotional when they have a Cancer Moon, a Scorpio Ascendant and heavy Pluto aspects. Robin shows the true personality and psychological nature of a Cancer Sun, for his Moon is also in this Cardinal water sign. With these components, Robin William’s liquid features were constantly pushed and pulled like watery tides, as the waters would crest, break and splash on the shore, then regularly recede—to fill the empty space left behind. There was little emotional rest, for this sensitive crab. With a Sun/Moon conjunction, Robin’s internal emotional reactions were indistinguishable from his external attempts at self-expression. In other words, his emotions were always churning— and the tidal waves become tsunamis! Watch Robin’s temples swell and his eyes bulge as the internal pressures build. Soon, the cardinal waters would erupt, carrying him away on a new wave of emotions. His claws would paddle and flay about as he tried to steer his out-of-kilter shell through the turbulent currents. When the waters withdrew, he exhibited Cancer’s need for stability. In reaction, his powerful pincers often latched on to the first securing anchor that appeared. One of the results of this urge for most Cancer personalities, is that their closets become packed with all sorts of treasured booty. With his double Cancer, Robin Williams easily identified with children. In “Mrs. Doubtfire”, he showed us how difficult it is for male crabs to let go of their brood. In“Hook”, he was an adult returning to childhood. In “Jack”, he was a child. In real life, he’s was a devoted father and family man. Sadly, we all know the results of these overwhelming emotions. With Sun and Moon in the 9th house, Robin attempts to keep things joyous, humorous and even silly. Like with most Cancers, the lunacy waxes and wanes with the Moon cycles (changing polarity every two or so days when the Moon enters a new sign). In those rare moments when Robin was not in an expressive or reactive mode, his psychological nature would suddenly still, as his luminaries “went on hold”. In these moments, his facial flesh would deflate and still, to reveal the subterranean elements in his facial and body structure. He would suddenly appear cubical and heavy, rather than round and buoyant. The block head, square jaw and hooked eagle’s beak also became more noticeable, as his eyes reflected a depth and mystery up to here unsuspected. Robin’s Scorpio Ascendant has made its transformations. Robin’s Scorpio was more than a mask—it affected everything he touched. (His Ascendant ruler Pluto conjoined Mercury, as it sextiled Neptune and squared Jupiter). 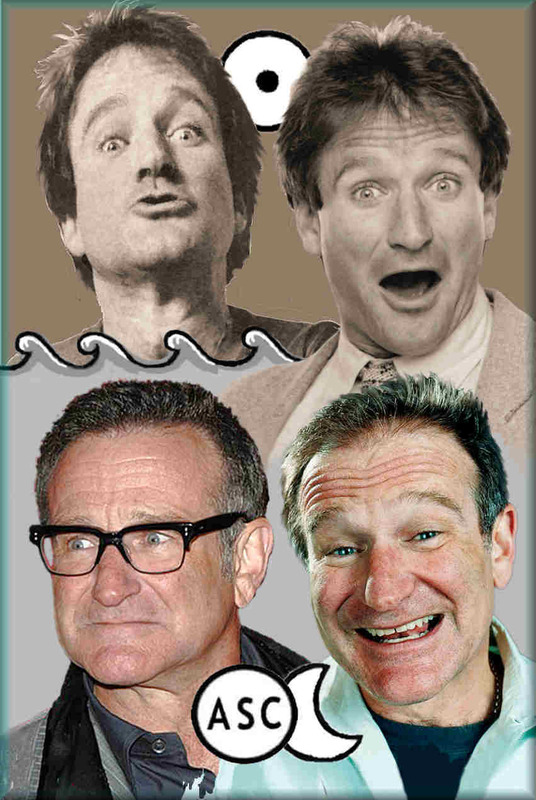 These aspects give Robin the ability to create images so powerful they’d leave us either shaken or transformed. With every chuckle, there’s often a “Oh, my God —what was that?”. This powerful Scorpio presence was revealed in Awakenings. Bird Cage opened some unsuspected doors. Dark, Plutonian themes prevailed in Jumanji, The Fisher King and Dead Poet’s Society.